I freakin' love this Diana and when I first saw the pics, I thought it was from a magazine! I cannot wait to get your assistance when it comes to ideas for our new farmhouse plan! I love it all! That desk turned out just perfect, great tutorial as well :) Thanks for the shout out too! That makes my day! I am glad you got some of those coffee sacks, I think they make for great decor, you totally scored with the one they sent you, I like the neutral colors (mine were blue). That surf board table is too cute as well! 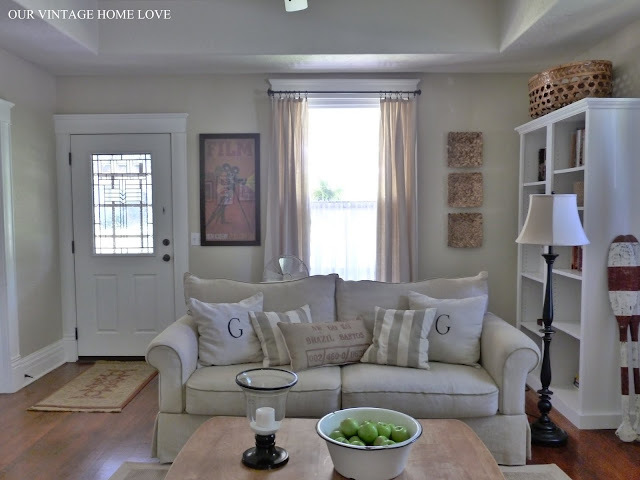 Love, love, love your living room! The paint color is so lovely too! I'll have to show my hubby this!!! The desk it perfect! I'd like to make one and use it in our guest bedroom next to the bed, a desk/nightstand combo. And, your living room is delightful! I love all the accessories in the room. It gives me some ideas for my own living room! You are just amazing! (And don't you have four children too??) It is SO inspiring to see how a creative person as yourself can pull together such a beautiful room with so little money, and of course, a lot of elbow grease. What a hard worker you are. Your room is twice as beautiful as anything in a catalog, and most of all, because you had a vision and did it yourself. Your hubby is so sweet to scout for things for you too. Love, love it all! Wow, your living room is beautiful! I love the new desk! And that dining table-turned-coffee table is genius. Love that little desk! You make that look so simple. Maybe I'll look around for an old table that will donate legs! You're living room is lovely, too. Wow, is there anything you can't do?? :) I showed my husband your blog the other day and he goes "You should be more like her"! Haha, I'm going to try and start building my own simple stuff too! This room is absolutely beautiful!! I love everything about it! Great job on the new desk!! I LOVE this room...and even better, my husband loves it! :D I was showing it to him to give him an idea of what I'm going for in our living room, and he even asked me to send him the link to the photos! I also have to ask where the sofa came from...I'm looking for a similar loveseat. Thank you! Lisabella, thank you! We've had our sofa for years and bought it at a local furniture store that is no longer open. i love your room. its so serene and clean yet personalized. its an area i battle, trying to make it mine without clutter. well done lady. its probably here somewhere but could you share with me the wall color? You are so talented and you inspire me to try things I never thought I could do. You & Layla ( TLC ) .......... Amazing ! I look forward to your blog ! I ask about your walls in your bathroom redo if you textured them or where they that way and you must of forgot to answer. Love it Diana! Great Job! The room looks great! It all looks so beautiful...and clutter-free. What talent you have! Love to you! I just found your blog and love your style and admire your talent! I look forward to following you and seeing what your next project is! I wondered if you made the picnic table in the picture on your sidebar and if so, have you posted plans? Also, a nail gun is on my wish list. What would you recommend? Thanks for sharing your beautiful home on blogland!! Your living room is beautiful! Thanks for sharing it with us. I love the new desk & the surf board inspired sofa table. You really are so creative! You and I have great taste. Bwahahahahaha! We do think alike, Sasha! :) Thanks Jamie! Terri, the photo on my side bar is from Country Living, so I can't claim the table.....though I might have to try making my own. lol......it is gorgeous. :) I'm so drawn to anything with an X in the design, it's one of the reasons I love barn doors so much. Thank you Carrie! Your comments made me smile. Love the basket up on the shelf! What a fantastic room, it is quite beautiful. The desk is great.... and you did an awesome job on it........but this room???? Over the top DEEEEEE.LISH. I love the softness and simplicity of it.... it's just yummy. Found your through "The Inspired Room" and HAD to become a follower! 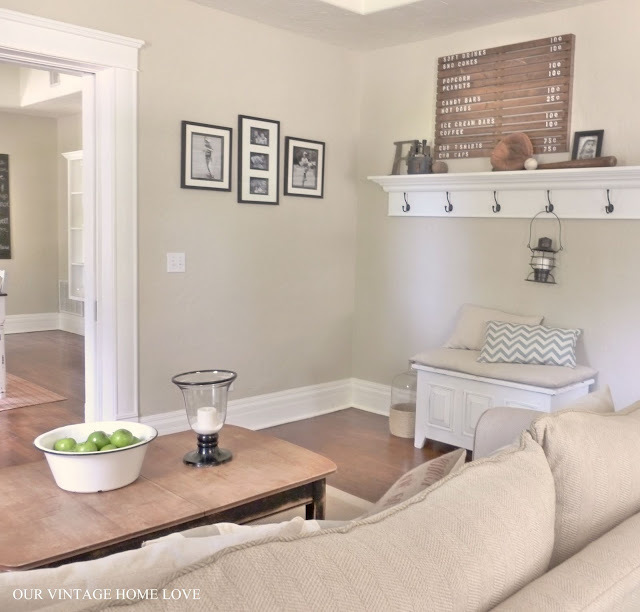 Shared post with residential architect hubby and we both agree that your creativity, eye for design, generosity and clarity in sharing your ideas, inspiration and content, make "Our Vintage Home Love" a terrific read. It's also left me jazzed about learning to do some carpentry! Just saw this post. Such a gorgeous room! You make me want to paint our living room over...again! LOL! I would love to have white woodwork but am not up for all that work...just yet :-) Thank you for the beautiful photos as inspiration. I'm a white lover too! Where is your couch from!? I love it! Just found your site and loooove it! Are there sheers in your windows? if so, how did you hang them? I need a little bit of privacy for my living room windows but have blinds up now that I'd love to take down. Also, did you make your curtains? The design of your living room is pretty lively. It shows how clean you want your living room to be. The white concept of each and every piece of furniture stands out whenever the sun shines on it. And that shows that your windows are perfectly place too. Nice! The room shows how creative the designer is. It is so cool and really great. Did you paint the book shelf and the table with a brush or did you spray it? This blog is really great. The designs are so cozy that when you live in such a home, you would certainly have all the comfort you can have. Vintage designs are just so wonderful. Hi Diana! I was wondering where you got your couch? Did you put a couch cover on it? I love them! They look like they are pretty durable too! I bought microfiber couches about three years ago and they already have some tears in the cushions so I was looking to recover them. The square plates(?) on the wall between the bookshelf and the window, where are those from? Love! Love the whole living room - inspiring me to re-arrange my corner for my desk! Thank you for sharing! Awesome designs of antique desks within your living room. The information that you shared here regarding antique desks is amazing. Thanks for sharing such a wonderful post . Please could you tell us what colour you have painted the walls? We've been searching for this kind of colour for months! This looks great! I am moving soon, and I have been looking at Living Room Furniture for awhile now. I found some that looks kind of like this stuff, its pretty awesome! Beautiful! I painted my kitchen/dining room Manchester Tan a few days ago. What did you use on the ceilings? Also, what sheen do you use on walls and ceilings. My husband talked me into satin, usually do flat. It's growing on me. Thinking I should do eggshell for the ceiling, though. Thank you!! Beautiful! I just painted my kitchen/dining Manchester Tan and the ceilings are next. What color did you use on ceilings? Also, what sheen do you use on walls and ceilings? Thanks!! Where did you get this rug? 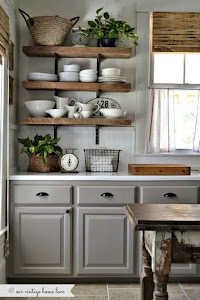 Where did you get the large white shelf with hooks? Thank You!